For any so-called activist campaign to succeed, it would help if the campaign weren't based on lies, fraud, and engaging in the very activity one purports to oppose. Such it is, again, with People for the Ethical Treatment of Animals -- emphasis on "ethical". Based on its most recent smear campaign against PetSmart, however, PETA appears to be ethically challenged when it comes to defining the word "ethical". One of the organizations operatives, Jenna Jordan, allegedly lied her way into a job at a PetSmart in Arizona in order to generate fake news about the company. Such is just one of the allegations against her in a lawsuit filed by PetSmart. The company alleges that Jordan lied on her application (she’d been fired by a Florida Zoo for the same reasons PetSmart is alleging); “illegally recorded hours of video containing audio conversations and she provided these videos to PETA”, also subsequently exposing company confidential information against the terms of her employment contract; failed to abide by the contract which constitutes breach; breached her fiduciary duty to PetSmart; and based on all the lies, she engaged in trespassing in order to commit the alleged illegal acts. PetSmart is suing for compensatory damages, actual damages for the unlawful recording, attorneys fees, and for an injunction requiring her to return all materials to PetSmart. The lawsuit also alleges that PETA took all of the illegally obtained video footage, and deceptively edited it in an attempt to smear the company. This is exactly what she was alleged to have done at the Florida zoo. Smear campaigns like these are a valuable fundraising tool for activist organizations. Who wouldn't get upset at the so-called "cruelty to animals" that the organization captured on video? Such an activity is designed to gin up viewers’ emotions. Feeling powerless to do anything in front of their computer, they are urged to donate. The organization raised $46.3 million in 2017 alone, just from contributions. 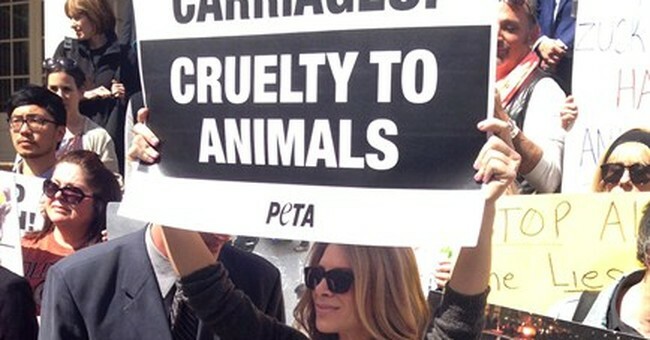 But that’s par for the course with PETA. The uninitiated might mistakenly believe, visiting the PETA website, that it is oh-so-serious about preventing animal cruelty. Except the organization's mission statement is so ridiculously radical that it literally considers everything as qualifying under that term. Sorry, you can't eat an animal of any kind, even a turkey at Thanksgiving. It's also a Bozo no-no to let your cat outside. Then again, they don't even want you to own pets in the first place. Thus, rather than let animals at least live in “no-kill shelters”, it created “kill shelters” to relieve allegedly suffering animals from suffering in a “no-kill shelter” by killing them. PETA supports kill shelters and has one at its headquarters in Norfolk, Virginia. In 2017 alone, almost two-thirds of the nearly 1000 dogs, and 80% of the nearly 1500 cats that PETA brought into its shelter were killed. Those numbers are actually an improvement from 2005 to 2012, where 90% to 97.3% of animals were put down. So zealous is PETA to murder animals that it stole a 9-year-old’s pet Chihuahua because they thought it was a stray dog, had to pay a $49,000 judgment as a result. Not only that, PETA tried to change Virginia law in 2015 in order to exempt it from doing what animal shelters were legislatively permitted to do: find animals a home. But since PETA thinks owning animals is a mortal sin, they’d rather kill them instead. Which leaves one to wonder who it is, exactly, that should be caged up.